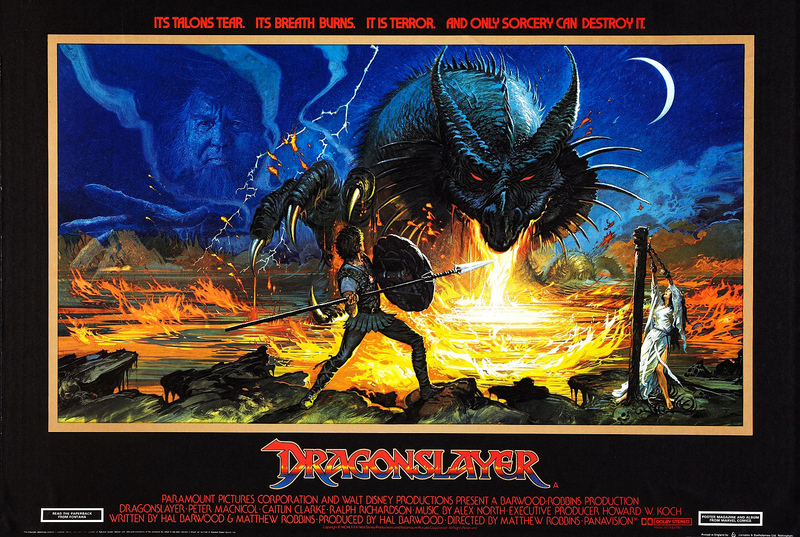 Dragonslayer (1981) | 'TAIN'T THE MEAT… IT'S THE HUMANITY! 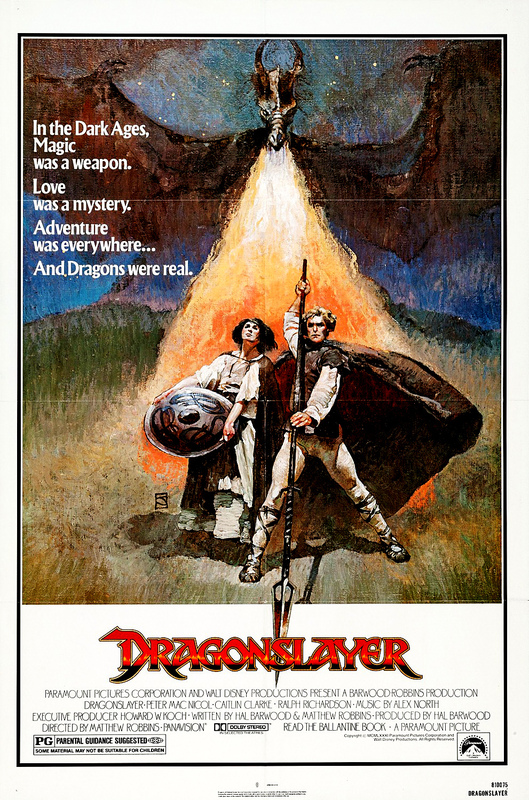 It’s 1980’s Fantasy Movie Season here at TTM, and this week it’s the turn of Disney’s Dragonslayer from 1981. Featuring one of cinema’s most memorable scaly fire-breathers Dragonslayer was released as a co-production between Walt Disney Productions and Paramount Pictures. Set in 6th century medieval Europe the film starred Peter MacNicol as Galen Bradwarden, apprentice to sorcerer Ulrich, played by Ralph Richardson. After the death of his master Galen undertakes to rid the kingdom of a 400-year-old dragon (the wonderfully named Vermithrax Pejorative), who has plagued the land for decades. He is aided by village-boy-with-a-secret Valerian (Caitlin Clarke), and hounded by King’s henchman Tyrian (played with brutish glee by John Hallam), before facing-off against the dragon in the film’s explosive finale. And as it’s a Disney film there’s also a princess thrown into the mix (Chloe Salaman). The film, ably directed and co-written by Matthew Robbins (*batteries not included), featured special effects work by Industrial Light and Magic, and a music score written by Alex North (Spartacus). Fans of Disney’s usual family orientated films would have been been surprised, maybe even shocked by Dragonslayer‘s more adult content. The film was far darker than the standard Disney fare and in some places quite shocking: Salaman’s Princess Elspeth, for example, meets a particularly gruesome fate, as do several other luckless characters. Dragonslayer may well have been a Disney film but it was far more violent and mature than the average Disney fan would have expected. Even though that darker tone certainly worked to the story’s benefit, it didn’t do the film any favours at the box office, where it bombed badly (it pulled in barely $14m against its $18m budget). Audiences, it seemed, just weren’t ready for a scary, far more realistic Disney fantasy movie and so they stayed away. Over the years it has enjoyed a brief resurgence as a cult film but sadly, on the whole, Dragonslayer has been largely forgotten. 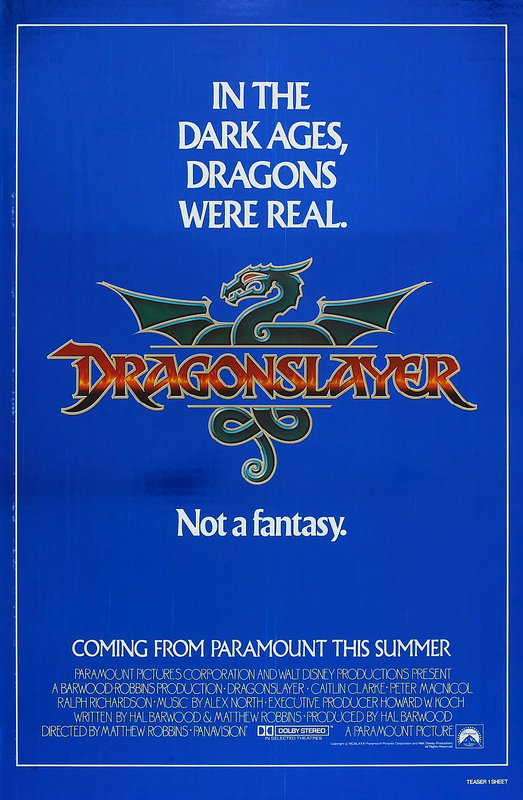 The teaser poster for Dragonslayer. Which is a shame as it’s a great movie that has held up remarkably well over the years. The story is engaging, there’s plenty of action and the ending is wonderfully dramatic. Robbin’s direction is adept — his use of realistic candle lighting during the film’s opening scene’s still holds up well — and the movie has that wonderfully muddy verisimilitude that fans of Peter Jackson’s The Lord of the Rings films will immediately recognise. The film also plays with the audiences expectations of what a Disney film should be: there is a princess in the film but not only does she not end up with the hero, she dies in a rather ghastly way. The film’s other characters are well drawn and believable and — in MacNicol and Clarke’s case — genuinely likeable. 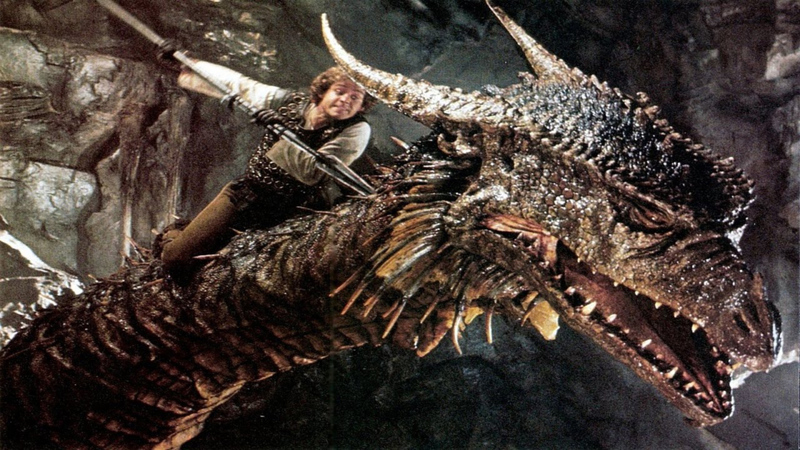 But as good as the cast are, the film’s real star is Vermithrax, the dragon. Created by ILM using a mixture of full scale models, miniatures and stop-frame animation Vermithrax is one of cinema’s best realised and more memorable creations (Vermithrax’s many fans include director Guillermo del Toro and Games of Thrones author George R. R. Martin). Having a life-sized dragon to act against clearly benefitted MacNicol’s performance during the film’s finale, but not only that, it just looks awesome. Even if the film was bad (which it isn’t) Vermithrax would ensure it’s place in movie history. Dragonslayer, in short, is a terrific fantasy film, darker and more violent than you’d expect from Disney, and a movie that’s long overdue a reappraisal. NEXT: The 1980’s sword and sorcery movie season continues with a classic from 1982, The Sword and The Sorcerer.